In the previous pAsuram, there was a reference to troubles with which samsAris (dwellers of the materialistic world) toil without praising emperumAn. As a corollary for that, AzhwAr says in this pAsuram that this is the result of their sins. idhu anRE – is it not this? vagai sErndha nal nenjum – the superior mind which is the gate for gyAnam (knowledge) to be manifested for the chEthana (sentient entity) who is with his physical body. nAvudaiya vAyum – the tongue which has been created along with the mouth in order to praise emperumAn. miga vAyndhu vIzhA enilum – even though they (sentient entities) do not get much involved with emperumAn since among the three qualities of sathva (pure goodness), rajas (passion) and thamas (ignorance) which they are controlled by, rajas and thamas overshadow sathva. 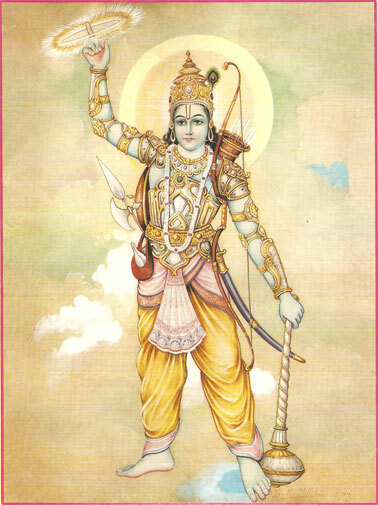 miga Ayndhu mAlaiththAm vAzhththAdhiruppar – Just as it is mentioned in SrI bhagavath gIthA 14-17 “sathvAth sanjAyathE gyAnam rajasO lObha Eva cha I pramAdhamOhau thamasO bhavathO’gyAna mEvacha II” (gyAnam (knowledge) results from sathvam (purely good qualities); desire (in svargam/heaven etc) comes out of rajas; involvement in insentient deeds (not ordained for us), crooked knowledge and ignorance which arise out of carelessness, come from thamas), the knowledgeable sentient entities should push out qualities of rajas and thamas to the background and through their sAthvika AhAram (proper food intake which is prescribed for us) and connection with sAthvikas (those who have predominance of purely good qualities), praise sarvESvaran (supreme being). But most of the chEthanas do not do this. idhuvanRE mElaiththAm seyyum vinai – isn’t this the sinful deed which they carry out which makes them to remain as samsAris (dwellers of materialistic world) in the times to come? mElai – times to come. vagai sErndha nal nenjum nAvudaiya vAyum – the superior mind which engages with one specific quality of emperumAn’s and the tongue which praises that quality. miga vAyndhu vIzhA enilum – even though the mind and tongue do not engage with other qualities of emperumAn’s. miga Ayndhu mAlaith thAm vAzhththAdhiruppar – the knowledgeable chEthana should analyse all the qualities of emperumAn’s and praise him. But, for most, it is not possible to praise emperumAn like this. idhuvanRE mElaith thAm seyyum vinai – it is due to the result of sins which we have committed in the previous births that the mind and tongue are not engaging with all the qualities of emperumAn’s. In bhattar’s interpretation, the term vinai refers to the sinful deed of not praising emperumAn. In thirunaRaiyUr araiyar’s interpretation, this term refers to the result of sins committed in earlier times. We will move on to the 45th pAsuram next. This entry was posted in iyaRpA, periya thiruvandhAdhi on November 19, 2018 by T N Krishnan.